Corey Brown rides Irukandji to win The Schweppervescence during Stakes Day at Rosehill. Irukandji has produced stallion Dundeel’s first stakes win and is quickly targeting a second with the Group One Sires’ Produce Stakes now under consideration. 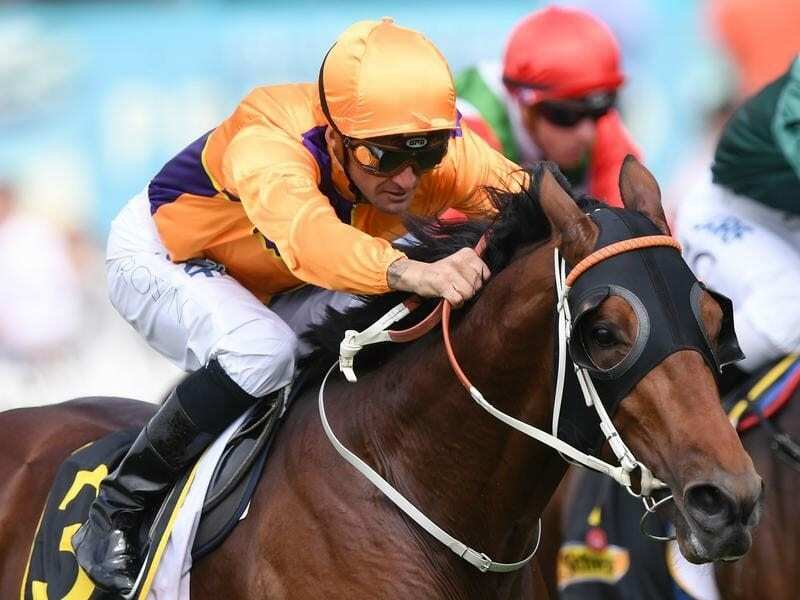 The $500,000 Spendthrift-owned two-year-old faces a seven-day back-up providing he rebounds from Saturday’s convincing victory in the Group Three Schweppervescence (1400m) at Rosehill. Co-trainer Michael Hawkes said the step up to elite level at Randwick next Saturday was possible for Irukandji after he benefited from a masterful ride from Corey Brown. “It’s pretty tempting. He can genuinely run the 14 and he might run further,” he said. Irukandji ($16) led turning into the straight and resisted all comers to win to break his maiden by a half a length from fast-finishing Aristocratic Miss ($9). Spin, the $4.20 favourite, was third a length further back. “He’s a lovely type and improving all the time. He’s another colt who’s going to go to stud,” Hawkes said. Dundeel retired after winning the Queens Elizabeth Stakes in 2014, and the six-time Group One winner has had eight runners and one previous win through Cutadeel in New Zealand. Hawkes paid tribute to Brown, who missed last weekend’s Golden Slipper day because of suspension. Hawkes was upbeat about Irukandji’s future and said if he didn’t tackle the Sires’ Produce Stakes next Saturday, the Group One Champagne Stakes (1600m) at Randwick on April 21 was an option.